Condo 2 chambres en bord de mer. Meilleur choix dans la région! Situé dans Aventuras Akumal, 2. 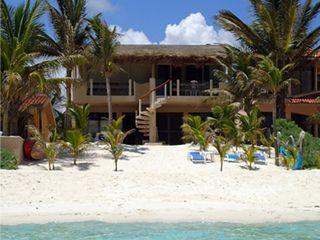 7 miles au sud de la baie d'Akumal, U-Nah-Kin (la maison de soleil en maya) est un bâtiment de 4 condo placé juste en face de l'une des plus belles plages de la région de Akumal. Cette plage de sable blanc est aussi l'un des plus visités par les tortues dans la saison de nidification. Notre unité est située au deuxième étage. Il offre une véranda confortable d'où l'on peut profiter de la belle vue sur la mer - les couchers de soleil sont inclus! Il dispose également d'un escalier en colimaçon pratique qui vous mène directement au sable sur la plage. Avec 2 chambres et un futon dans le salon, ce condo peut accueillir de 1 à 5 personnes. Les deux chambres ont des fenêtres vers le côté de l'océan, de sorte que vous pourrez profiter de la brise dans tous les coins de la copropriété. Le condo est entièrement équipé: chambres climatisées, connexion Internet et télévision par satellite inclus, Kayak, hamac, barbecue, et parking. La suite avec vue sur le jardin (la deuxième chambre) s'ouvre directement depuis le hall d'entrée, vous offrant une intimité totale, mais vous pouvez également y accéder simplement en traversant la chambre à coucher latérale. We just spent four weeks in # 3 at U-Nah-Kinn in Advenuras Akumal. It is between 1 and 1 1/2 hours from the Can Cun airport. We were very happy with the condo, which is right on the beach so offers a spectacular view. Swimming, snorkelling and kayaking can all happen right in your front yard! We did not rent a car, as some have suggested, but found the taxis very reasonable and the collectivos accessible. We spent much less using these than we would have to rent a car. The staff: Ishamel who maintained the property to be immaculate; Karina, who cleaned the condo 3 times a week; and Fernando who was available to help solve any problems, were all wonderful. We appreciated Ishmael's advice on the area for shopping, beaches, and snorkeling. He also called taxis for us so he explained in Spanish what we wanted to do. We had no security concerns at all, as the locks in place were of high quality, and there was a beach security person on duty all night. There are 2 restaurants which both serve great Mexican food - the Beached Bikini Bar & Grill and the rooftop restaurant in the small resort - both only two doors down the beach. There were days when seaweed drifted in, but it was quickly managed by Ishmael, and is a fact of nature that can't be helped. We are returning next year and recommend this spot highly! Robbed, flooded, and no electricity. No response from owner. Management company service poor. Our 2 week trip to U Nah Kin was our worst travel experience. We are not being dramatic. Do NOT stay here. The condo was broken into and we were robbed. As instructed by condo owner we had locked valuables in the safe. The thieves easily broke into the cheap "safe". They got money, credit cards, laptop, cameras, cell phones, ID's, everything. The place was completely trashed. Now we are in a foreign country with nothing. Break in was via the tiny latch on the sliding door. On 2nd day of trip, I mentioned the lack of security on sliding door to maintenence guy. I asked for pieces of wood to prevent slider from opening from outside. I was told previous tenants had thrown them away because they didn't look good. Ridiculous. After the break in, I called the management company Villa Belmar. Fernando came out but had nothing to repair the lock. We were not going to sleep in that condo with broken locks! Lock/door repairs took THREE DAYS!! Fernando offered to pay for us to stay elsewhere. We were never reimbursed AND we still had to pay for those 3 nights at U Nah Kin. Service at its worse. Also worth mentioning we were not given key to deadbolt on front door. Took 5 days to get key from Fernando. Fernando told us there was theft insurance which would reimburse us. Most missing items were purchased on Amazon, so gave him receipts. We have not been reimbursed for loss. Instead, they are "conducting their own investigation" to "retrieve" our stolen items for us. Ya right... Thanks for nothing. After we returned to U Nah Kin we had serious rain. It rains right? But NOT in the living room! It wasn't a little leak. We had water pouring in through ceiling! I have video. We could not use living room or kitchen. Called Fernando from Villa Bellmar. He can't get anyone to help us because it's leaking inside multiple properties. Texted him several hours later... No response. Eventually the rain stopped thank God. Also the electricity went out in the condo. Eventually guy came to fix. Told us could only use one electric item in the kitchen at a time including electric stove. And the stove only had 2 working burners. Good luck cooking! And the smaller problems: maid only came 2x during 2 week stay. Should have been 3x per week. That led to not enough towels. There were not enough beach chairs for all guests of the property. And lots more. Im sure Fernando will respond with false apologies and promises to fix issues. Stay here at your own peril. We are very sorry for all the unpleasant situations that occurred during your stay. We also express our concern and our willingness to help you in everything we could. Safety conditions were reviewed - all doors and windows were replaced with reinforced units, tempered or safety glass was installed, as well as external protectors at the points where they could be the most vulnerable. All door and window locks have been replaced with more current and safe models. Besides, guard service has been adopted on the external parts as protection throughout the area. All the inconveniences, as a result of the heavy rainfalls, were repaired. And, complementing the services performed, the whole apartment was painted and refurbished internally. Once again, we reiterate our apologies for what has happened, and we are at your disposal to reward you in some way in the future if you are so kind to consider us for one of your next visits to our area. The home was everything we needed with an amazing view! La maison est parfaitement située, loin du tourisme de masse, au calme, avec des tortues qui sortent pondre chaques nuits. Les lits sont confortables et tout l'équipement est très bien. Si je reviens dans la région, c'est là que je louerai. Amazing location. The House was immaculate. The owners gave us perfect directions to the property and quickly answered our questions. We will definitely stay again! Our family 2 adults and 2 school aged children recently stayed at the upper level condo at U Na Kin in Akumal. We arrived late in the evening and did not have problems finding the location. We stayed in codo number 2 upper level with the spiral staircase . This condo needs a little work. The wall paint is coming off in some areas, the kitchen lacks a microwave and the toaster oven does not have the setting markings legible. The lighting flickers at times and the TV/Internet had issues with connection. Unfortunately we were also robbed in our condo while I was sleeping with my children! We left the back door mistakenly unlocked & someone came in early in the am and stole our camera. The codo directions do emphasize the need to lock all doors! Thank goodness we used the safe provided and that no one in our family was harmed. The owner Wilma and associate Fernando were helpful in this matter. However, we do feel the locks need to be updated and it was a bit of a burden to try and lock the back sliding door when we went to the beach. The back sliding door is challenging to lock and unlock with the key provided. The condo is not as well kept as the other 3 in this development as we made friends and viewed the other condo/rooms. I am referring to updated paint, lighting, furniture, and decor. On the positive note, the location/views were gorgeous, snorkeling right in the shore, and having a kitchen was very good for a family. We did enjoy the property for the most part, the housekeeper was good, and the garden keeper was very good as well. I do need to add, I have traveled to Mexico various times, and I speak Spanish. We did not have a safe trip overall, the PEMEX gas station tries to scam people, not just us, but other guests in the codo development shared with us similar situations. And stay near your location, do not go to a lagoon nearby as we had a very negative experience as well. Akumal est une zone naturelle protégée. Temps calme après 22 heures. ** ALL RATES ARE PER NIGHT BASED ON A ONE-BEDROOM / ONE-BATHROOM OCCUPANCY FOR ONE OR TWO GUESTS **** FOR 02-BEDROOM AND 02-BATHROOM OCCUPANCY OF THREE TO FIVE GUESTS - ADD $10 PER GUEST PER NIGHT ****** 19% LOCAL TAX SHALL BE ADDED CANCELLATION POLICY: A fee will be applied to all canceled reservations, to cover any incurred credit card or payment processing expenses. •	Cancellation before 90 days prior to the arrival date: fee of 20% of the total rent; •	Cancellation between 89 and 31 days prior to the arrival date: fee of 50% of the total rent; •	Cancellation 30 days or less prior to the arrival date: fee of 100% of total rent. •	Cancellation for any holiday reservation (Christmas, New Year's, Easter and Thanksgiving weeks) will result in the forfeit of 100% of total rent.